Vintage Globe Light 50 Foot Strands Just $18.24! Light up your outdoor or indoor space without breaking the bank! These Vintage Globe Light 50 Foot Strands are priced at just $18.24! These are waterproof, so you can use them outdoors on patios, porches, and more. The holders are not related to each other, and even if other bulbs are damaged or burned, the remaining bulbs will still light up. 5W energy-efficient bulbs reduce your electricity bill. 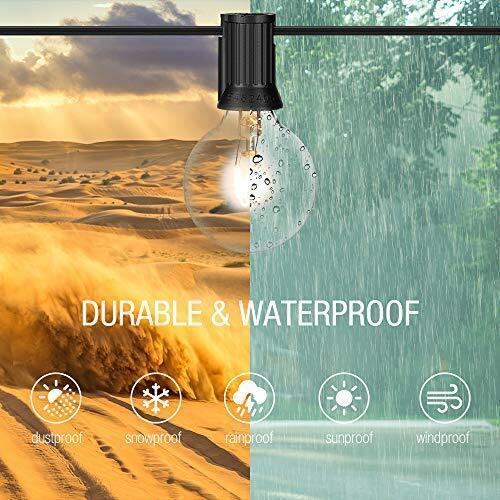 Connects up to 3 strands maximum. Comes with 2 spare replacement bulbs. IP54 waterproof grade for outdoor use. Tested cable, plug and bulb base are UL approved for safety. Top-class and heavy-duty fuse allows for up to 960w of connected lights.